Wearing his colours on the day Yeats made it 4 Gold Cups. For me June is all about weddings, garden parties, Pimms, lovely floppy blossoms, big hats and of course a Midsummer Nights Dream. But just before the Shakespeare comes another great pageant. Royal Ascot. Next week. I would not miss it for anything. Most of these photos are from an article we did for a magazine in 2009. It's a week long heady combination of fashion and the best horseracing in the world on the most stunning racecourse imaginable. It's a week where dreams come true and extraordinary things do happen to ordinary people - like us! The Queen attends every day and her arrival heralds the first race. Both the people and the horses appreciate temperate weather for this week, nothing too hot, or too cold and definitely not rainy. In the great scheme of matters much more important it is a week of frivolity - but it is often the small things in life which give us the greatest pleasure and long lasting memories. 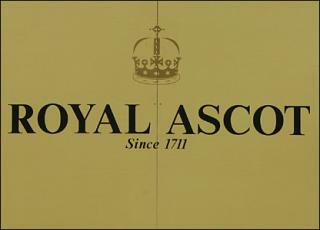 Last year Ascot Racecourse celebrated the 300th anniversary of it's creation. Every year those of us who follow horseracing, fashion and the royal family look forward to the week. We always attend at least one day and we had 4 of the most glorious years of our lives there with one great horse, named Yeats, who won year after year on Ladies Day, setting a record. We will never forget him. A bronze of him now resides in the main parde ring where he will overlook proceedings forever. 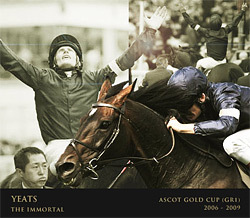 But Royal Ascot is full of great horses and each year we hail the current heroes and heroines. This year everyone is looking forward to the presence of an Australian legend, an unbeaten mare named Black Caviar. This current weather is not fuelling the familar anticipation as I wonder if I own anything suitable which I would be allowed onto the racecourse wearing. There is a strict dress code, especially in the Royal Enclosure where either well connected friends or your ancestors gain you entry. 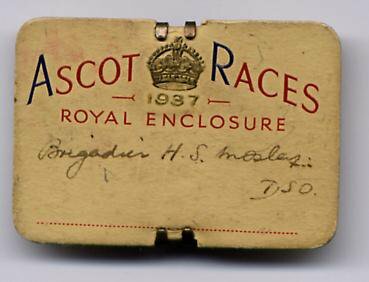 A wonderful old Royal Enclosure badge. Sadly they are now not so beautiful. This beauty attended on Ladies Day in the 1920s. 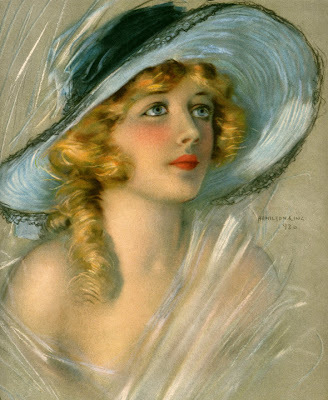 But she would never be allowed into the Royal Enclosure with those pretty, but bare shoulders! I fear I will end up a bedraggled wraith on the day whatever I wear. Our usual picnic in the car park will resemble a Mad Tea Party. Brollies will turn inside out in the wind. But on the day the racing will still be grand. Despite the celebrities who attend, the horses are the real stars all week. singing in the bandstand after racing. 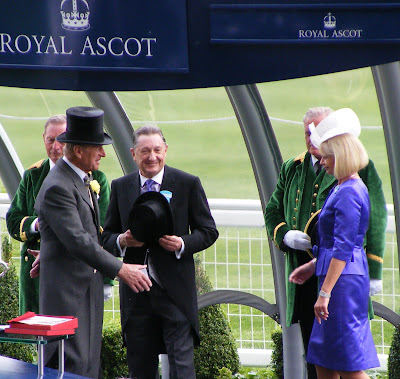 Prince Phillip presents a trophy to owners Mr and Mrs Derek Smith. It is a perfect place to people watch. You see everything from ridiculously expensive outfits to those lovingly sewn and resourced vintage. There are celebrities galore, serious couture and fun in equal measure. A couple we snapped one year. 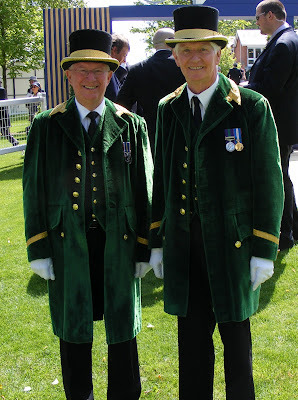 Two of the Queen's guards pose for us. It all kicks off next Tuesday when we will be there. It's always spectacular and so much work goes into it by so many people. This year, with the Diamond Jubilee as well it will be a once in a lifetime event and I feel very lucky to be able to be there. I hope my spirits rise to the occasion - and that the sun shines just a little more than it is doing today. Found you on Modern Country Lady's blog (Bea's) and LOVED your cat photos. Kudos for you and yes, they need to be neutered to prevent more animal suffering. I agree with you that June is the wedding month and let's hope we will enjoy some nice and sunny days coming. Hope you have a fabulous time and that rain will not stop your enjoyment!! A lovely uplifting post, thank you. Hope that you have a wonderful time on Tuesday, fingers crossed for good weather.